The Wooded Kingdom Purple Coin or Local Coin is shaped like a nut. These purple coins are scattered around Steam Gardens. 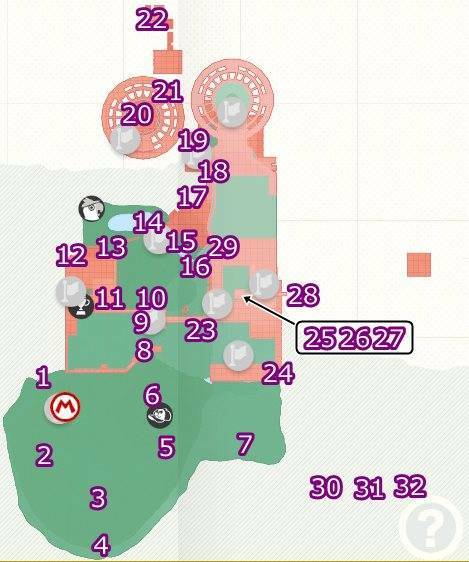 To help you find each purple coin in the game, here is a Wooded Kingdom Purple Coin Locations guide which includes a map of where to find each Wooded Kingdom purple coin as well as some directions on how to get them in the kingdom. From the Odyssey checkpoint, turn right to find a wall. Climb on top to find 3 purple coins. Inspect the back of the three near the Odyssey to spot 3 coins. Check the hollow on the base of the trunk below the Gold Rings to find 3 coins. Scale the moss-covered wall close to the drop-off point. Throw Cappy to gather the coins floating on the side. Head to the grove and check the back of the Crazy Cap Shop to find 3 purple coins. Climb the trunk of the three to reach the tip, then throw Cappy to haul them. Capture an Uproot by the ridge looming over the spawn location, then extend its legs to collect the 3 purple coins floating in the air. Climb on top of the wall overlooking the habitat of the Goombas using ground pound then jump to scale it. Inspect the Sphinx to trigger a riddle to unlock the secret room containing 3 purple coins. To reach the platform, do a backflip. The answer to the Riddle is Flowers. Trail along the stream on the right of the drop-off point to reach the ridge above. Operate the lever to scale the upper platform above the entrance. Examine the left side to reach the 3 purple coins hanging on the ledge. Climb the stalk to reach the charging station, then drop down to the Goomba’s habitat. Stick to the left wall until you find a gap in the wall to enter. Squeeze through and grab the 4 coins inside. Return to the Iron Road entrance and capture the Sherm to remove the rocks obstructing the door. Capture the Uproot, then extend its vines to collect the group of coins resting on the right topmost edge of the stack of cages. When you reach Iron Road, go around the red building. Leap past the fence, then catch the Uproot. Have it climb onto the grey block then spring upwards to collect the 4 purple coins. Dive into the water then pass through the green pipe to enter the challenge area. Halfway through, Mario encounters three purple coins inside the gap of the platform. Jump inside to obtain them. From the Iron Road pennant, drop off of the damaged steps to find 3 coins floating on the water. Beyond the Iron Road pennant, scale the mossy platform to collect the 2 purple coins beside the wall. Drop off to the pool near the Iron Road to find 4 purple coins lying beside the wall. Cross the bridge and jump quickly as it is fragile. Locate the path leading to the Broodals, spare the rest of the grey blocks to keep a platform to reach the coins. Capture an Uproot and reach for the 4 purple coins floating above. Enter Iron Road, then continue along the path to find a gap in the fence leading to a yellow pole. Drop to the floor below and continue marching to the right to find 3 coins stashed in the corner beside some creeping leaves. Head to the Sky Garden Tower then run to the second platform. Catch an Uproot and return to the platform below. Jump onto the beam and spring up to collect the 3 coins. Before you head to the Broodals area, drop to the beam above the Sky Garden Tower then collect the coins resting on the platform covered in moss. Cross the first flower bridge, then turn right and follow the path with the fragile bridge. Get around to reach the right side to find purple coins lying on the crates. Use Cappy to collect them. On Summit Path, take a detour to the rocky platform which looms over the Goomba’s habitat to find 3 coins. These coins spawn near the Iron Wall Sherm. Head to the corner to spot some ledges fixed onto the wall. Scale these and do a long jump to reach the distant ledge. Jump again to find 3 coins at surrounding the curve of the building. Grab a seed from the Steam Gardener near the Secret Flower Garden. Take the path to reach the Observation Deck. Capture an Uproot and take the stalk to reach the hidden location. Think fast to reach for the 3 coins hanging below the gold rings. Follow the path on your right, then leap across the platforms to discover a door embedded with Cappy. Inside, follow the trail of flowers to find 3 purple coins at the center of the platform. As you ascend the ramp leading to the Summit Path, reach for the platform above on the right. Go through the door Cappy marked door. Capture a Sherm and proceed to the third tank level, fire at the purple coins to gather them. Once you finish the Flower Garden, climb the Iron Mountain Path to encounter a Steam Gardener. Operate the button to trigger the path that leads to the Red Tower platform. As you reach the Observation Deck, throw Cappy to pull the coins in. Go past the fence that is close to Iron Mountain to reach the courtyard. Drop down the ramp to find a leveled walkway, then scale the tree to collect the pair of coins. After jumping down, hug the wall moving to the left. Capture the ? then push the rock out of the way to reveal an alcove containing 3 coins. Proceed to the leftmost section of Deep Woods to find a trunk. Climb on top of the log and collect the 3 coins floating on the opposite side. Move to the rightmost section of Deep Woods to find a collapsed tree stump bearing 3 coins.